So, basically, I went through and calculated the number of fights it generally takes to reach a level and, by adjusting a few settings in my game, counted the number of steps taken to go from one place to the next. For the Cave, I ended up with about 480 steps, which, since battles pop up about every 15th step, equates to 32 fights. 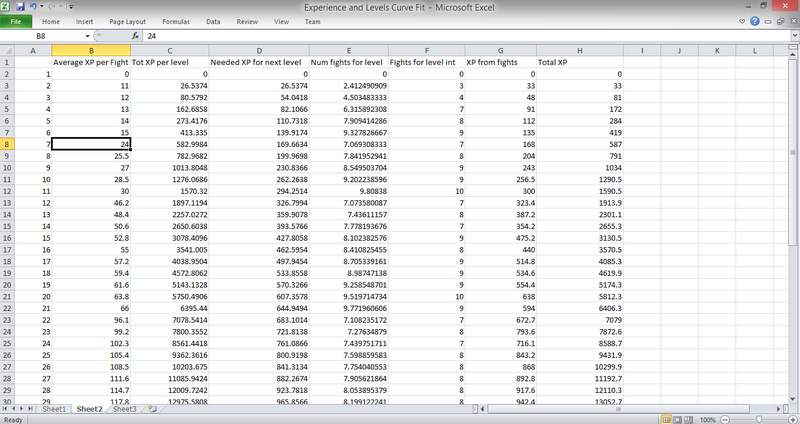 Now you can count the number of fights to get the amount of XP for each level, which came out to 299 experience. Throw in the 400 experience gained from the three boss fights, and you’re left at about 100 xp shy of level 8 (which is about where I’ve been falling on my play-throughs, so good job matching up theoretical and experimental data). The point then comes to this: I have to force the player to go into more fights more often (and using the math numbers I can actually make a general guess and likely get pretty close), or I have to increase the amount of experience gained from boss fights (which is something I brought up maybe 5-6 posts ago, where I wanted more of the focus to be on bosses as opposed to fighting hordes of unimportant characters). While I haven’t actually made a decision where I want to go, I wanted to take the time to highlight the mathematical analysis that went into this decision and actually figuring out what I wanted to do. With the minimal amount of work I had to do, I’m suddenly capable of understanding my game in a much deeper (numerically speaking) way. I can figure out what needs to go into each level to make sure the player hits the points when I want them to hit the points, as well as planning out experience points gained from different things, the regular fights and the boss fights (also seriously I should have bonus experience drops added to the game because that sounds fun, and helps alleviate the problem a little… yeah I think I might actually do that soon-ish and see how that works as well. NO WAIT SERIOUSLY HERE’S THE ANSWER. So I’ve been trying to figure out a way to make traveling to the numerous ruins around the various scenes more important, and I think it might behoove me to make it so when collecting a treasure chest the player gains additional experience, in addition to whatever bonus items they might get. I like the sound of that… also I should add in experience stones, basically like the Rare Candy items in Pokemon. Free levels for those who want it. ALSO I SHOULD ADD IN SEEDS LIKE IN DRAGON QUEST.) … That was one hell of a parenthetical aside. Rounding back to my point, I’m just really glad I’ve found myself easily capable of creating and providing this kind of analysis to my game. I think it speaks volumes about the education I received and my ability to think analytically (numerically) when trying to solve a difficult problem. I’m still kind of shocked by that parenthetical aside (I do try to keep these relatively stream of consciousness because I want to actually have people feel like they’re getting real insight into me and who I am), but I suppose that’s how my brain works sometimes. With all that, I suppose I’m all finished until the next update. See you then!